Even in the criminal underworld, there are varying levels of morality. Mike, who has been made a full partner alongside Walter and Jesse, is the quintessential “stand up guy.” Sure, he gets his hands dirty when the job requires it, but he’s going to look out for his men and stay true to his word. This episode opens with Mike visiting his nine henchmen in prison and ensuring their ongoing loyalty by promising to recoup their hush money, which has been frozen because of the DEA’s investigation of Gus Fring. “You will be made whole,” he promises them, not just because he doesn’t want them to flip, but also out of a personal sense of honour. No such moral code exists for Walter, who decides to move back home without even bothering to consult his wife. He blithely unpacks his belongings, including a tattered copy of Walt Whitman’s Leaves of Grass (“Take warning – I am surely far different from what you suppose”), completely oblivious to Skylar’s horror. But who has time to notice a wife’s revulsion when there’s work to be done? After a mesmerizing cook sequence, Walter gently pries into Jesse’s personal life under the guise of father/son-type bonding. Jesse, desperate for Walter’s approval, listens in rapt attention to his mentor’s relationship advice. “Secrets create barriers between people,” says Walter, ostensibly encouraging Jesse to come clean to Andrea. “I know you’ll make the right call. If she loves you, she’ll understand.” But Walter knows that Jesse doesn’t expect anyone to forgive his sins (especially his soul-crushing part in Gale’s murder) when he can’t even forgive himself, and masterfully manipulates his impressionable sidekick into ending the only good thing he’s got going on in his life. Walter, of course, couldn’t care less about the emotional fallout. Once he realizes that Andrea’s out of the way, he can barely fake enough interest to let Jesse finish telling him about their split. Not that Walter is entitled to be giving anyone else relationship advice. After a spectacular meltdown, a horrified Skylar awakens to find her husband bonding with his kids over the bloody ending of Scarface. Creator Vince Gilligan has often described the show in interviews as “Mr. Chips turns into Scarface,” and while the scene seems a little too on-the-nose for Breaking Bad, it’s redeemed when Walter is heard softly muttering with glee, “Everyone dies in this movie.” Foreshadowing, anyone? Meanwhile, cracks are already starting to appear in Walter and Mike’s uneasy alliance. The final scene has them quibbling about how much money Mike’s incarcerated men should be allotted. The issue is seemingly resolved when Jesse shames Walter into agreeing to it by offering to cover his cut, but there’s clearly trouble ahead. The closing moment sees Walt musing to Jesse about Gus’ throat-slicing of Victor, suggesting that, like Icarus, “maybe he flew too close to the sun.” The implication is clear: this is what will happen when a subordinate like Mike (and possibly even Jesse) overreaches. Skylar: The more unhinged Skylar becomes, the more of a threat she poses to Walter. From her glorious “shut up, shut up!” freakout in front of Marie to her increasingly unnerving interactions with her husband, she’s becoming a real contender in our “who’s going to take Walter down?” betting pool. It can’t be a coincidence that the standout moments of each episode so far this season feature her responding to her husband’s actions with a look of pure terror. 9 blue crystals out of 10. Walter: Remember when Walt was terrified of contaminates, even going so far as to shut down the lab to prevent a housefly from polluting a batch of meth? Those worries are gone; he now has no problem cooking in a roach-infested house. It’s no wonder; from his casual encounter with a child he once poisoned to his manipulation of his sister-in-law to his episode-ending threat, the implication is clear: Walter has become the contamination. 8 blue crystals out of 10. 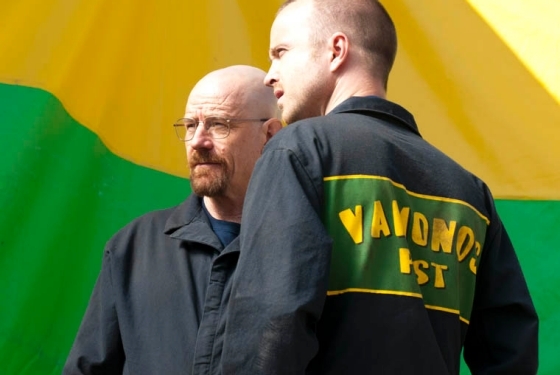 Jesse: Jesse no longer waits obediently for Walter to tell him what to do; instead, he’s now stepping up and offering solutions, from his magnet plan in the season premiere to his equipment moving scheme in this episode. Of course, he may be evolving in his professional life, but Walter is still pulling the strings in his personal life. 6 blue crystals out of 10.